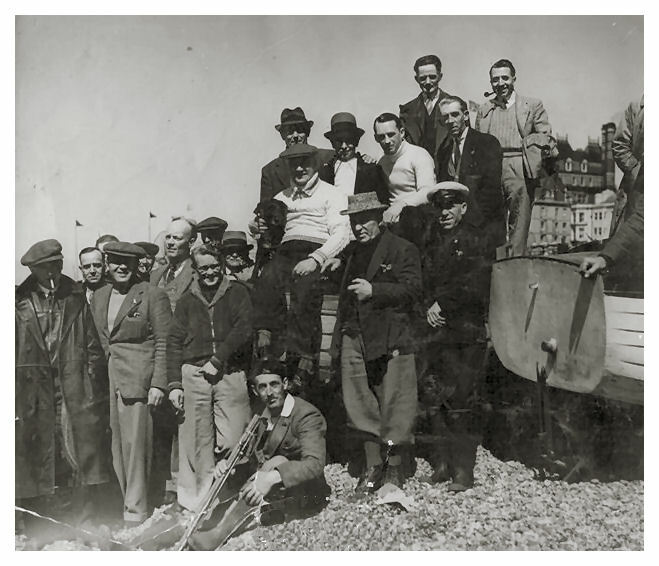 This photo is of a group of Brighton Deep Sea Anglers around 1950, although I am not certain of this. My father is the bloke with a pipe at the back. He was known as Dink ‘Benny’ Benham. Of course he did have a proper name, but it was never used. A club house between the piers? I don’t know why he was there with the group, as he didn’t fish. Also he never smoked a pipe at home as far as I can remember. I think he just knew them and went to their social get-togethers. I believe the Deep Sea Anglers had a club house and bar on the lower prom between the piers. Can anyone throw any light on this group? Maybe you can recognise someone here. If you can, please leave a comment below. I don’t think its Brighton or Hove, the buildings in the background don’t look right! It can’t be Brighton, because there is no prom wall behind the beach. No lawns behind and too close/steep for Hove. Also too steep in the background, for Worthing or Seaford. Puzzled Peter! Hi Pat, At the time you mention the Brighton Deep Sea Anglers’ Club was at 139, King’s Road Arches and the Hon. Sec. was B. Potter of 67, Sackville Road, Hove. There was also a Hove Deep Sea Anglers’ Club at the Western Esplanade, Hove. Regards, Andy. I think it must be Brighton as King’s Road Arches would be right Andy. Thanks for that. Isn’t it the Metropole roof in the background? The prom would be obscured behind the boat. No the sea wall is too high by the Metropole, its just not right for Brighton! Hi Pat, I’m pretty sure you’re right about it being the Metropole in the background. The roof-line matches perfectly, as does the adjacent building, and the flags correspond with those along the front. The beach was relatively shallow and the sea wall fairly low at that point, but annoyingly the camera angle is low and the group cunningly arranged to obscure most of the background. I have a picture taken from almost the same spot in the 1890’s which virtually matches the background of your picture. I know that spot Peter. There is no reason why my father would be with this group in any other town. After all, he had to get home for lunch! I have checked old photos of the Metropole. They show those features. The height of the promenade could quite easily be obscured from this angle. Please note that in my introduction at the top of this page I was questioning the date not the location. My father told me this was Brighton beach. Hi Andy and Pat. I looked at the James Grey website for a similar view of the Metropole, plenty from the oposite angle, but can’t find one from the east side looking west. I drive past most days on my way home from work, I’ll have a look tonight, then perhaps get my camera. Hi again Pat and Andy, I could have “egg on my face”, you could well be right! As I drove past last night I took a look, big changes there since the 1950’s. The view of the building and roofline is much different today, unrecognisable. When you look at the Metropole now, at a glance its not apparant, but look closely and there have been big changes. It looks like a huge wing has been added to the east side since the photo. This completely oblitarates the side buildings seen in the photo, however one small thing has dashed my view, the 2 tall chimineys at the rear, I think they are still there today, hidden behind the extension! I’m out of the country next week, probably get a chance the week after to take a photo from the same angle. Let me have your email address and I’ll send the photo! Really I would like a better look, but I think I should start my apology now! Peter. Thanks for that. If you contact the website they will forward it to me. Hi Pat and Andy, Some of the faces look familiar, but sadly I can’t put a name to any except Tommy the boatman, he’d be the one in the peaked cap by the stern of the boat – no idea what his other name was. Some of the names I can remember were Bill Budd, Tommy Sewell and Albert Smith. It might be my grandfather, Bert (short for Hughbert) Potter standing next to Tommy the boatman. Yes, the clubhouse was one of the arches between the two piers and the outboard motors, oars and other equipment were kept in (what I can only call) a half arch on the Hove side that was situated on the stepless side of the steps to the upper prom. There was a snooker table back behind the bar and at the very back, tables and chairs where they used to play cards etc. You could go upstairs to a sort of lounge area where you had a view of the piers, beach and sea. I would love to know how you know Bert Potter. Great to have some names, Pieter. Thank you. I think Andy will have taken the name B. Potter from an entry for the anglers at that time in the local directory. My later Kelly’s for 1958 shows J. Knight as the hon. sec.. Perhaps he took over from your grandfather. My dad (Jack Bryant) was a member of the Brighton angling club, and the club house was at the arches, he often took me to the club house, and when they went out in the boats, I used to sit upstairs in the club house and watch the boats go out to sea through the binoculars. They used to tie the boats together in a long line, and then they would separate when they reached thier destination for the duration of the fishing time they had. I did go out with my dad once, and I remember that I caught more mackerel than he did, perhaps that’s why he only took me the once. My dad died in 1959. I just wonder if there is anyone who would remember him. Smashing dad, good memories, he did so want a son, but got four daughters, and we loved him to bits. Regarding the photo I believe it was earlier than1950. I have been associated with the Alllen West Angling Club since 1951. The boatman was Tommy Markwick,both he and his wife Ivy were fisherfolk, she was the only female fisher I can recall who put to sea on her own, netting herring. Regarding Ron Elphick he and I sat on the AW committee for many years and he was Secretary of the Festival Committee who held their meetings at the Deep Sea Club. Each club had two representatives on this committee- the other rep was Jim Mant. I remember Billl Budd as being a member but in later years the names of Stuart Holt and Alan Roscoe were synonymous with the Deep Sea Anglers. Thanks for that Geoff. We have got one definite name now. Pieter de Lang also identifies Tommy, the boatman in the peaked cap, and you have given his surname. Pieter also suggests it is possibly Bert Potter next to him. Hopefully with these leads we will manage to name a few more faces in time. I am pretty sure that my father, John Holmes, belonged to the Deep Sea Anglers Club and I remember him pointing out the arch that it was housed in. There was a thriving fishing club at the Pedestrians Arms in Foundry Street in North Laine until it closed and changed hands in the early 1970s. PADSAC (Pedestrians Arms Deep Sea Angling Club) met in the back bar and there was an old map of the Channel on the bar wall showing the off-shore reefs, all named. I worked with one of the PADSAC members who told me the following: One character, Gilbert, was appointed to take a member’s ashes out in the Channel and give them an appropriate burial at sea; however Gilbert did not realise the urn would be thick plastic, which of course floated. Then ensued an hilarious scene with Gilbert trying to sink the ashes and urn with one of the boat’s oars! Not quite the dignified end hoped for! Sonia – that’s interesting that you have spotted your grandfather Maurice Broomfield. If we are now thinking this photo might have been taken in the late 1940s, would you say the age of your grandfather looks right for around that time? Sorry to come back with a late response, but nothing had been happening on this thread for nearly two years. My Dad was a member of this club (1954?). His name was Len Dobson and he had a friend called Ernie Meecham. I remember the clubhouse was on the beach between the piers, I think. Anyone recognize the name? So wonderful to read all this!! My dad John Scragg was a member from roughly the early 50sun till around 1964 when he got his own boat and we moved to Essex. I have great memories as a very young boy, going out with my dad and brother. Great you can remember so far back, Dave. I expect you were too young to recognise anyone in the photo, or any of the names mentioned. Any chance? Hello. Does anyone know of a Mrs B.H. Oyler? I have an old clock presented to her in 1959 from the Brighton Deep Sea Anglers. Thanks. Bertram Henry Oyler (1901-1970) lived at 36A Russell Street at that time. Thank you Andy. Interesting… wonder if he was into fishing, or if that was his wife? "Any more for the Skylark?"